Synopsis: Can a lack of clean underwear save the civilized universe? Torq Vandermellonhearst, the orphan son of a human father and alien mother, a boy with an intelligent worm living in his brain, learns that it was his parents final wish that he return to Earth, a place he believes is populated with dragons and princesses like the fairy tales his father told him as a child. How can Torq get to Earth? 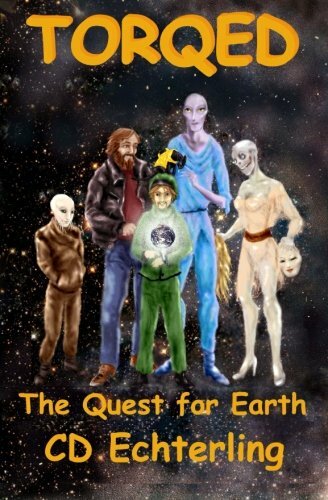 He is smuggled off his home planet by his "retired" pirate uncles, Dag and Walt, assisted by the former temple priest, Nole au Zhou, the brain-enhanced lizard, Rafin and snarky android, Lonnie, who use their talent for swindling to help. Aided by ninja hair stylist, Rand'ell, they fight the evil Dr. Murrow and his cowboy waiter robots to end his rat burger restaurant empire and win a meat shipping container to send Torq to Earth. But what did Torq's parents plan for him to do on Earth and can he fulfill his own dreams of fighting dragons and finding true love? First he must deal with his eccentric aunts and uncles in their decrepit old mansion with alligators in the basement. Torq and his cousins Vanilla, Robert and Louis, Steven's sons, and the run down android Jeeves must find the key to the mystery hidden in the mausoleum to which Torq has been exiled by his greedy Uncle John and Aunt Modesto. And what about the underwear? It's complicated.